Does Carbon 14 dating destroy the evolutionary model? Nathan Jones: There are all these dating techniques like Carbon 14 that we hear about from Evolutionists who say these methods prove that the earth is millions of years old. I hear many pastors and preachers even claim that Carbon 14 dating has proven that the earth is millions of years old. How do you respond to these claims? Mike Riddle: Well, the first problem is that we have a lot of people talking about the age of the earth who have never really been to the labs to see how these dating methods really work. The first thing we need to understand is that every one of these dating methods, whether radiometric dating, or radioactivity which is what we are talking about when one element changes another, these elements change, just like when we get older we change. For instance, put a banana out there for awhile. What happens to it? It turns brown, and then it is only good for making banana bread at that point. Things change and elements do too. One element will change to another over time. Those changes are used as a measurement. The key part we must remember firstly is that every one of these dating methods is based on assumptions. Assumptions are not mentioned in the textbooks. Every one of these assumptions have been proven to be faulty and in error. So, if your premise or your assumption is false, your conclusion will also be in error. That fact's not being taught. I'll give you some examples. Lava flows in New Zealand were shown dated at 275,000 years old, when in actuality those lava flows were made in 1949. Pretty big error there! Mount Saint Helens is a very good example of these dating errors. In May 1980, rocks were formed from the lava flows that erupted out of the mountain. The eruption also created overnight a canyon that looks like Grand Canyon, proving the Grand Canyon didn't need to take millions of years to form. Anyway, these rocks created in 1980 were actually dated at over two million years old. So, even when we know when a rock was formed, we still never get the correct age. Why then should we trust the dating of the earth when we don't even know when the rock was formed? Geology labs can take one rock sample, date it by say four different methods (though there a lot of different methods that we can use), and come up with four very different ages ranging from hundreds of millions of years of differences in age. These tests then clearly are not reliable. Nathan, you mentioned Carbon 14 dating. The simple thing about Carbon 14 is that after about 80,000 years all the datable Carbon 14 has decayed out of something. If we find something with Carbon 14 in it, it means it has to be any datable Carbon 14, meaning it has to be younger than 80,000 years. Let's look at coal, for instance. The Institute for Creation Research did some studies on coal. They took coal samples which according to Evolutionists coal is millions of years old and should have no Carbon 14 in it. ICR took their coal to an Evolutionist's lab to make sure there'd be no bias. Guess what they found in every coal sample? Carbon 14. That coal in truth is not millions of years old will never get published. The ICR then did a study of diamonds. Diamonds are a very special kind of stone because they are made up of pure carbon. Diamonds according to Evolutionists are supposed to be hundreds of millions to billions of years old, so there should absolutely be no Carbon 14 in those things. But, they took these diamonds samples to the lab, and guess what they found? In every diamond sample? Yes, Carbon 14. Carbon 14 is a powerful testimony this earth has to be young. Dr. Reagan: I was also under the impression that in Carbon 14 dating one of the assumptions is there was never a worldwide flood. Mike Riddle: Right, there is that assumption behind Carbon 14 dating that creates false readings. The inventor of Carbon 14, Dr. Willard Libby, even noticed his assumption was false, but he ignored it because of his belief in Evolution. Dr. Reagan: I've also been intrigued by findings recently of dinosaur skeletons that actually contain soft matter in the bones. And yet, dinosaurs are supposed to be hundreds of millions of years old, right? Mike Riddle: Right. Paleontologists have been finding dinosaur skeletons with proteins, red blood cells, and tissue that is even stretchable, and they are finding Carbon 14 in their bones as well. Dr. Reagan: How can that be if these skeletons are hundreds of millions of years old? Mike Riddle: Simple, they can't be that old. But, here is the best explanation that we are hearing now from Evolutionists to explain the organic tissue found away — there is some unknown process that preserves soft tissue for millions and millions of years. Well, that's what you call a" rescue mechanism." It's not based on any observable science. 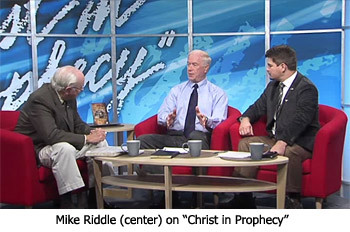 In the eleventh and last segment of this Creation training series with Mike Riddle, he'll explain why Evolution is every bit a religion. I was reading and came across this verse. Eze 34:29 And I will raise up for them a plant of renown, and they shall be no more consumed with hunger in the land, neither bear the shame of the heathen any more. I don't know what Bible version you read from but the NIV is an easier read to me. 22 I will save my flock, and they will no longer be plundered. I will judge between one sheep and another. 23 I will place over them one shepherd, my servant David, and he will tend them; he will tend them and be their shepherd. 24 I the Lord will be their God, and my servant David will be prince among them. I the Lord have spoken. To me it sounds like the verse you refer to is referencing the time of the millenial reign of Christ on Earth (especially since it says David will be among them and tending over them. If anyone else has a better or truer reply please respond. must watch and hear video on youtube titled, "Christ testimony of the churches -around the world." there are two identical Jesus Christ revelation 17:8. most of revelation is happening in the spirit world. that's why Jesus said it would be like the days of Noah and Lot. the abomination of desolation is happening in the spirit realm inside all these man made buildings set up for worship. the Christians and catholics, etc are not aware of what's happening to them and around them in these places, (churches -any four wall building representing God to gather believers of Christ). these churches around the world are all connected to "The Great City" Revelation 11, which is spiritually called Sodom and Egypt and Mystery of iniquity. Church leaders around the world are searching of the earthly signs. this will not happen until the very last day and hour. God will not allow man to destroy the earth with nuclear bombs. read matthew 3:12 and Revelation 20:9. God sends his son to the earth with the fire behind him consuming all his enemies which are left from the resurrection of the dead and those that are alive. the body of Christ is gathered as the son of man appears at last sound of shofar, he is coming while the wheat are gathered and the tares are left as the chaff and earth is consumed by the fire of God.